You know what it is like, one week through a holiday and I had already read the two books I loaded into my suitcase and find myself, craving something to read, and standing in an enormous bookstore trying to make a decision. 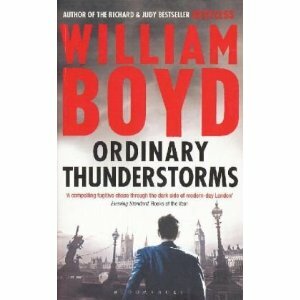 Two things made me select Ordinary Thunderstorms by William Boyd, firstly I absolutely loved one of his earlier books, Restless, secondly there was a sticker on Ordinary Thunderstorms declaring it to be in Whitcoulls (the New Zealand store I found myself in) Top 100 books. It must be good then right? I suspect the only reason I finished this book is because I paid top dollar for it and I had nothing else to read at the time. I have not come across a less plausible thriller opening, and lets face it some thrillers are pretty unlikely in their opening scenarios but this one absolutely takes the cake. Main protagonist Adam is an English climatologist, who has been working as an academic in the US in recent years but after the breakdown of his marriage he returns to the UK and is applying for work in London. The novel opens one afternoon as he has just attended a job interview for an academic post in London. Craving some Italian food Adam stops by a little Italian restaurant in London where he starts up a conversation with a medical scientist. The scientist leaves first and Adam notices that he has left a briefcase behind. Adam having some time to kill that afternoon decides to return the briefcase personally. When he enters the doctors apartment he finds the doctor stabbed. The doctor, still alive, begs Adam to remove the knife protruding from his stomach. Not knowing what else to do Adam complies and then flees the apartment. Basically Adam returns to his own accommodation to find a thug waiting for him and so rather than go to the police he decides to run, change his identity and live as a homeless person on the streets of London. The plot touches on noble themes such as research cover ups in the pharmaceutical industry, but honestly, I loathed it. The plot barely sustains itself as the increasingly annoying and unlikeable Adam Kindred fights for survival and assumes a new identity, while being pursued both by the police and ex military heavies employed by the pharmaceutical company to shut him up. Has anyone else read anything from William Boyd? I can't believe the guy that penned the mesmerising spy thriller "Restless" came up with this. More astonishing, I can't believe this book made the Top 100 books for a leading bookstore. And yes, I agree that the " best lists" produced by various people/institutions can be puzzling at times! Bah, 'best list' says who? is what I say. I haven't read that book, but I have Restless to read and I have read and really enjoyed Any Human Heart by Boyd. I thought Any Human Heart was a slow mover at first, but there was something about the style of writing and the characters that lured me into the life of this rather un-extraordinary man who lived an extraordinary life... or life lived him, would be better to say. I'm wondering if Boyd's the type of hit and miss author? I'm looking forward to Restless. Back from holidays to major flooding.